Avast, ye mateys! One of my favorite holidays, Talk Like a Pirate Day, is just around the corner. And this year, Krispy Kreme is celebrating the holiday by offering FREE donuts. Arrr! Ask for a donut in pirate speak, get one free glazed donut. Come in dressed like a swashbuckler, get a free DOZEN! 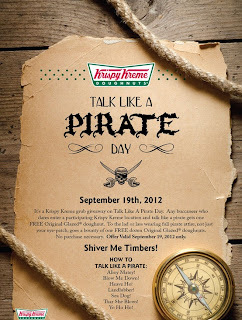 Tell me, fellow donut fiends, what pirate phrase will you use to get your freebies? Arrr, I be fond o' yer fried portholes!